BusinessWeek, NPR, ABC News, CBS News, BBC, CNN, MSNBC, Al Jazeera & all Arab media, FOX, PBS, USA Today, Wall Street Journal, The New York Times, The Guardian, The Washington Post, The Detroit Free Press, The Chicago Tribune, The Los Angeles Times, The Philadelphia Inquirer, The Boston Globe and Mail, Newsweek, The Weekly Standard, The New Yorker, Le Monde, and Le Republic. 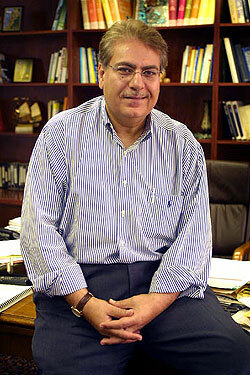 Successive American administrations have sought Mr. Siblani's counsel at the White House on issues related to the Arab World He is a frequent lecturer on U.S.-Arab relations Siblani helped found the Arab American Political Action Committee (AAPAC) in Dearborn and the Congress of Arab American Organizations (CAAO), which is an organization with an unprecedented success at fostering cooperation among the community's many groups. Mr. Siblani is the recipient of several awards from local and national prestigious entities. He received the "Spirit of Diversity in Journalism" award from Wayne State University, He is the first to be inducted from an ethnic media outlet, and the second Arab American invited to Journalism's Hall of Fame after the induction of the legendary late Helen Thomas in 1993.